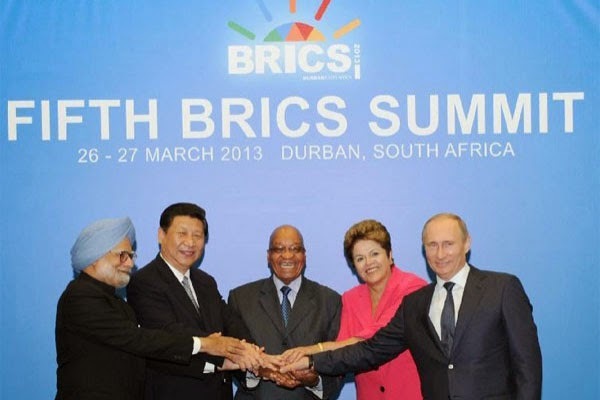 The BRICS nations — Brazil, Russia, India, China and South Africa. Since its first summit in 2009, the group has struggled to institutionalize its otherwise incoherent grouping, which is often at loggerheads politically and is too geographically disparate for a security framework to be viable. It even has discordant views on how to manage trade, which has precluded a trade partnership from materializing. (7/2014) World's emerging economies launch rivals to the World Bank and IMF: $100 billion development bank, to be headquartered in Shanghai, and a currency reserve of the same size, institutions that aim to be both competitor and antithesis to the World Bank and International Monetary Fund. The New Development Bank (NDB), announced at the sixth BRICS summit in Fortaleza, Brazil, has been billed as an answer to decades of grievances in the developing world about a global financial architecture that critics say the United States and Western Europe have exploited to enforce the subservience of the developing world. Though at first the NDB will bankroll badly needed infrastructure projects in the BRICS nations, other countries will be permitted to buy in and apply for funding. Despite the ambitious rhetoric of BRICS officials, their projects are not the first of their kind, nor will they compete with the 66 years of development experience under the World Bank’s belt or with the liquidity of the $755 billion IMF. Most economists describe the BRICS bank as complementary, rather than a rival, to the World Bank — in fact, the World Bank president himself has welcomed the BRICS’ venture as a means of filling the vast funding gaps in rapidly developing countries. In contrast to the World Bank, the NDB will begin as an egalitarian venture among the BRICS, with each founding nation contributing $10 billion (before the bank’s value is doubled at some point) and holding equal voting power. Even though China's economy is larger than that of the other four members combined, the country has agreed to hold an equal stake in the bank — a sticking point for India that has delayed an agreement for two years. China will hold a larger stake only in the currency reserve, which is a sort of emergency fund, like the IMF, that is meant to protect BRICS nations from another global crisis.